Here we are at the 25th of the month again, so time once more to make a Christmas card or two. If you still don't know what this is, pop over to Scraps of Life by Scrappy Mo and find out all about Rudolph Day. Between some health issues within the family, and my new found interest in trying more complex crochet designs, I do not seem to have had much time for card-making, but I am happy to be getting a head start on my Christmas cards, so I was determined not to miss this challenge. 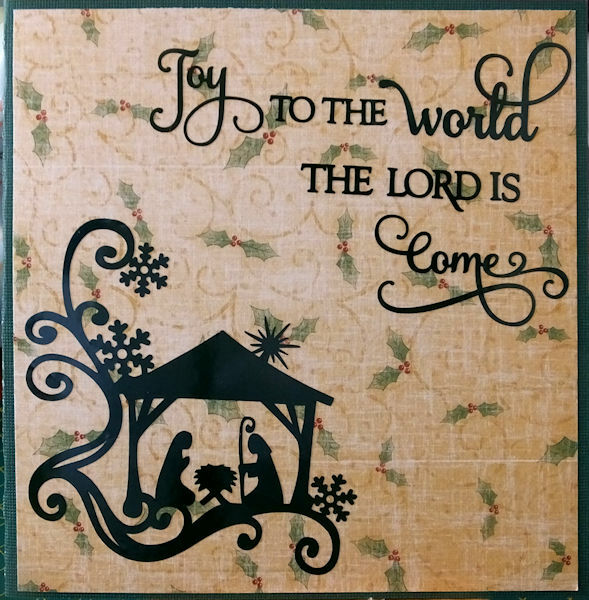 A long time ago I purchased some nice Christmas corner flourishes (cutting files), from the silhouette store, but I have never got around to using them. So this week I made some templates for card fronts in the Studio software, and played around with the corners, some script cutting files, and a stamp that hasn't seen ink in a long while, until they all fitted on my template, and came up with two designs. The first fitted best on a rectangular card so I stamped the image in Memento pistachio ink, added colour with my copic markers to the holly around it (all part of the stamp), and cut it out with a plain oval die. I distressed the edges, added a small amount of glitter glue to the trees and holly, and set it aside. 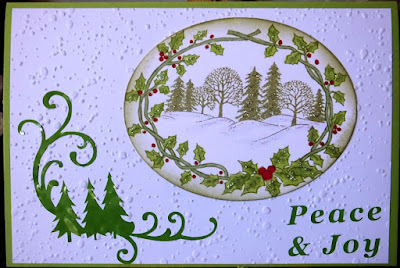 Next I embossed a piece of plain white card with my snowy embossing folder - sorry there is no make on it and I can't remember where it is from- and added it to a light green base card. I cut the corner flourish and sentiment from matching green vinyl, and assembled it all. The base card was made from half a sheet of the European-size card sometimes sold in Lidls, so I used the other half to make a second one the same. My other design fitted better on a 15cm square card, so I rooted around in my Christmas snippets box and found a piece of holly paper for the background. I made a dark green base card, and cut the corner and script from dark green vinyl. I then made a white base card, used a snippet of blue and silver backing paper, and cut the corner and script from navy blue vinyl. So that is four more cards to add to my stash, and I shall now link them up at Scrappy Mo's, and as I haven't visited lately, I will also take them to Pixie's Snippets Playground. I especially love your first one it fantastic. Gorgeous cards, Kate, I especially love the Christmas corner flourishes. Three gorgeous cards, lovely EF on the first card and the images and sentiment. The second and third card the black image on the papers looks fabulous. Love your snowy card! That embossing folder is so pretty and so is your scene. It fits at Merry Monday too. 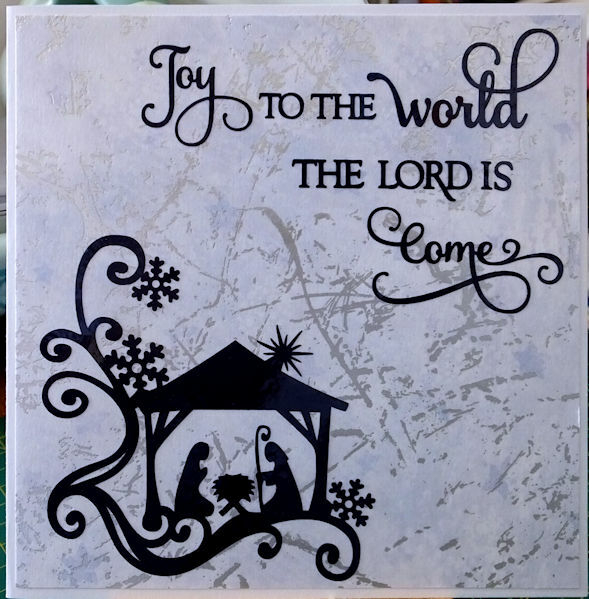 Beautiful cards Kate - love the silhouette nativity you have cut. Really nice makes for this months Rudolph Day! Absolutely gorgeous Rudolf day cards, Kate! All wonderful. That stamp on the first is rather beautiful! Both cards look fantastic Kate. Such a beautiful Christmas cards. A super set of cards Kate, they are all lovely. Your corner cuts are really nice. I think I like the the third one best, I like the holly backing paper, and the nativity corner and sentiment are lovely. I am very sorry being this late with my commenting. Thank you for joining our April Rudolp Day challenge, your creation fits for the occasion perfectly. Sorry it has taken me so long to get by and comment on your April entry. My Mum is in and out of hospital and lives 5 hours away! We have had many trips up there in the past few weeks. Daughter is still recovering from ankle surgery and needs lots of assistance as she is not able to drive yet. Your cards are fab. I LOVE the religious themed diecuts. They are wonderful. You always amaze me at how many cards you make...a truly dedicated paper crafter!